Every summer I search for the perfect coral lipstick/gloss and nailpolish. I don't suit sharp, citrusy corals (which I think look amazing on darker skintones), but love a soft pink-toned coral. This year, I got lucky! I spotted a pretty gloss on a MAC girl this morning, tried it on and purchased straightaway (normally I have to try every option available). Rather bizarrely named, 'Strange Potion', it's a Limited Edition lipglass from MAC's Surf Baby Colour range and costs £13.50 (though I got it for slightly less as Debenhams currently has 10% off most beauty products). Described by MAC as: "Summer’s highest, most power-charged shine…shaded for the season", it comes in a cute, brightly coloured tube with a doe wand. A really pretty, subtle but definite coral with a lovely sheen that catches the light, I can see this being my go-to gloss for the summer. Because summer is coming, right? It doesn't have amazing lasting power, though what gloss does?! I don't really expect a gloss to last more than an hour or so and am happy to reapply regularly. What's your perfect coral? I'm always open to new ideas. 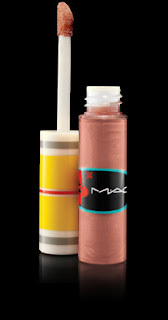 MAC lipgloss is available here. It's such a cute color! It looks absolutely great on you. Laura, excited to read your review now! Love the coral - such a pretty look for Summer! Have you seen the new Lancome nail duos? One is called Aloha and it is amazing! That is really lovely on you!